The point of painting is not THE painting. It is PAINTING. The end result doesn’t matter, but enjoying the process does. Plowing through all your new library books in a five-hour reading marathon is a legitimate choice. Don’t worry about rationing them out all week. You can just read them again. Footie pajamas make a great, warm layer under snowpants and no one will know you aren’t dressed. When caught doing something you shouldn’t, the best defense is to flatly deny and walk away. It confuses the opposition. Stripes go with plaid, pink goes with purple, and socks don’t need to match. If someone questions your clothing choices, start crying. They’ll backpedal instantly and think twice before doing that again. There’s really no logical reason why you should get the housework done before you have the fun adventure. I mean, when you really think about it. Yahtzee is better if you don’t overthink it. When in doubt, go back to the beginning and start over. We took the kids camping this summer. I haven’t done much camping in my adult life due to my inability to develop a talent for sleeping on the ground. And it is a talent, I can only assume, given that other camping people don’t seem to end up sleeping in puddles at 3 a.m. or have boulders rise up out of the ground to stab them in the shoulder, despite the tent area being a smooth sea of cushy grass at set-up time. Clearly, there is some sort of genetically-linked gift (strategically placed fat pockets?) that allow some people (the power of slight, unconscious levitation?) to sleep comfortably on the ground (bones that rubberize after dark? Internalized water repelling capabilities?). I don’t have that gift. Despite this, when I think of my childhood, the times spent crammed into a tiny camper, eating Dinty Moore beef stew and roasting marshmallows, take up a surprising amount of memory space considering we only went for a week or two per year. 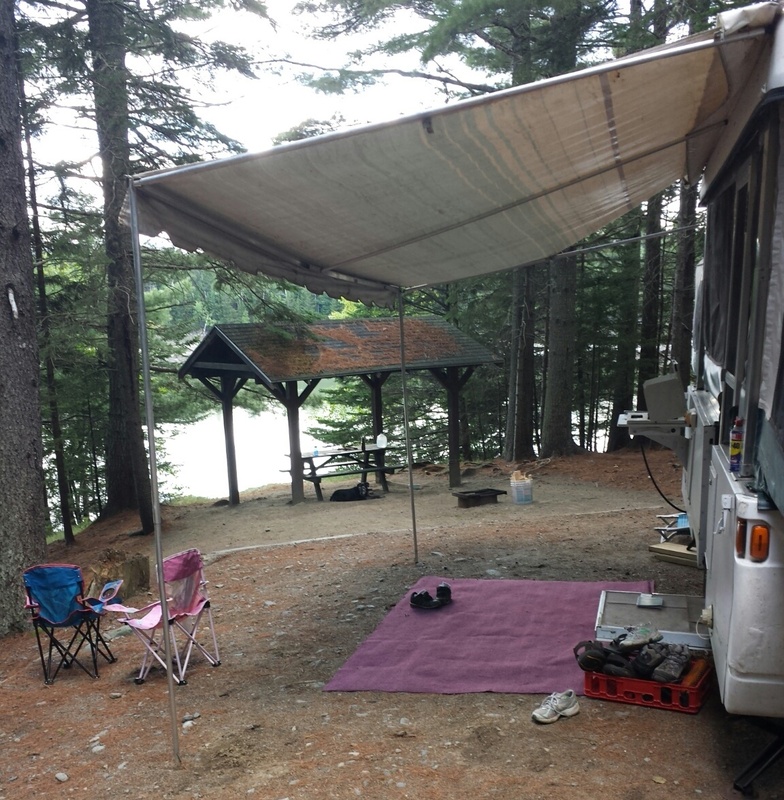 Sometimes we took an old Army tent instead of the camper, and I can bring to mind the exact smell of that damp canvas, the ring of the metal poles as they clanked together in their bag, the feel of grit under my sleeping bag. In contrast, I remember nothing about my entire second grade year. Not a thing. It’s a complete blur. Anyway, given the importance that camping memories have for me, it was clear that I would need to find a way to take my kids off into the wild. And that way would have to keep me off the ground. And because we still have a half-built house, that way would have to be justifiably cheap. These conditions puzzled us for a while, but last fall some friends were selling their pop-up camper. Have you experienced the wonder of the pop-up? It’s got the scrappiness of a tent…but with beds. Beds that are a good five feet off the ground. My god, could anything be more perfect? Needless to say, we snapped that up and last weekend, we finally got around to taking it out. Like other events on the child-adult experience divide (*cough* Christmas *cough*), once you cross to the other side you suddenly realize that things don’t just…happen like they did when you were kid. You don’t just “go camping” like I remembered. Before the camping part there is the buying and the cleaning and the packing and the sorting and the winnowing and reminding and the reserving and the panicking and the frantic searching and the testing and the hooking up and the driving and the unpacking and the…well. You probably get the point. It wasn’t how I remembered it. Except for the part where “I just need to hook up the trailer. It will only take a minute” turns into an hour of sweating, swearing, debating, cajoling, wrestling, banging, finally connecting, and “Oh, hell, the lights don’t work. What should we do? Just drive carefully?” That part was EXACTLY how I remember it. Other things were how I remembered them, as well. We went to Cobscook Bay State Park, which I tented in once, many moons ago, with Michael before we were married. (I know it must have been before we were married, because I sure wouldn’t have volunteered to sleep in a tent AFTER we were married.) My mother insists we went there when I was a kid, too, but I have no memory of that. In truth, I probably do have memories of it, but it’s just blurred into all the other state parks we’d camped in through the years. When we arrived, it was like a sudden time warp back to my childhood. Same pine needles, same pit toilets, same initials carved into the picnic table shelters, same state park brown paint slapped on every wooden surface. These state parks. They never change. They exist outside of time. They are stable and eternal. They are perfect. It was a successful trip, but not perfect. We went fishing. We traipsed around back roads. We foraged some of our food–clams, mushrooms, berries, fish. We washed dishes outside. The kids seem to fight more than I remember fighting with my sisters (SHUT UP, MOM), Sam got sick and didn’t sleep well, and I had to take Annabel on a middle-of-the-night run to the pit toilets where I heard something large breathe right next to me. It poured torrentially our first night and, while the camper didn’t leak, that unpleasant, musty dampness hung on.But I didn’t mind, what with being five feet off the ground. As you may remember (or maybe not; it’s been a while), my relationship with hiking has been a mixed bag since I had children. While the image of scaling mountains with a toddler strapped on your back seems very wholesome and appealing (to me anyway), in reality it, well. It looks more like this (see 2011). But good news! Last year, we went hiking. A lot. We signed up for a local hiking challenge that required 12 hikes over the course of the summer and, whether it was the chance to compete for something or whether they were actually big enough to like hiking, we did it. (This one. I recommend it, local folks. It’s fun.) The kids already have started asking about the challenge again this year, AND I’ve taken them on one successful hike this season independently, so I figure this heady level of success makes me an expert on children’s hiking. Please, let me share my knowledge with you. No one else cares. 1) Harder, not longer. The worst, whiniest hikes were the ones that were gentle meanders because those? Were boring. Steps so steep they required stabilizing iron rungs? Yes. Borderline rock climbing? Yes. Vertical descents made of nightmares and maternal heart attacks? Yes. Long slow switchbacks that allow you to breathe while they give you a chance to take in the view and enjoy the day? OH GOD THIS IS SOOO HAAAARD. I’M BOOORRRRED. ARE WE DOOONE YEEEET? I’M HUUUUNGRRRRYY. So my advice is to pick your mountain, find the shortest, most brutal way to the top, and go for it. Your quads may not thank you, but your sanity will. 4) Each kid gets their own water bottle. Obvious, I know, but something you may ponder skipping once you realize you are going to be carrying all that water. Don’t. To save on weight, sometimes if it’s a short hike I don’t bring a separate bottle for me and just drink alternately from theirs (sidenote: I am not a germaphobe). They don’t at all mind sharing with me or Michael but with each other? Oh ho ho. No. 6) Keep band-aids in your bag. One hike last year was pretty much at the kids’ maximum ability. Covering 500 or so vertical feet in two miles round trip, it is a trail that most adults consider pretty moderate, but it is challenging for those with shorter legs. By the time we were coming down the mountain both kids were pooped and, as a result, careless. They both had minor spills that resulted in slightly bloody scrapes. Notice my wording there? “Minor,” “slightly,” and “scrapes”? Apparently it didn’t feel that way to the overtired sufferers of these wounds, who howled like they had lost one of their smaller appendages. In the midst of the fracas we discovered that we forgot to bring band-aids. Cue a whole new round of woebegone wailing. Everyone got over their boo-boos within five minutes but the scarring left by our lack of preparedness lives on. From then on both kids checked before every hike to make sure we had band-aids and that was the very first thing Annabel asked this year when I pulled out the pack. “Did you check to see if there are band-aids in there? Make sure you pack band-aids!” So. Band-aids. Bring them. Also, learn to say “It’s just a little blood. You’re fine” in a totally nonchalant way. 8) Put chocolate in the trail mix. Trust me. It started with a guest. When your house is small, like ours, you learn to be flexible with your space. The playroom is an alcove in the living room. The laundry room is our linen closet. Our office is wherever we sit down with a laptop. Our guest room is…Sam’s room. If you come to stay with us, we’ll put you up in a tiny room covered with dinosaurs and a twin bed. Sam, meanwhile, goes to have a sleepover in Annabel’s floor on the old crib mattress. Travel at Christmas broke up the routine and things went back to normal. 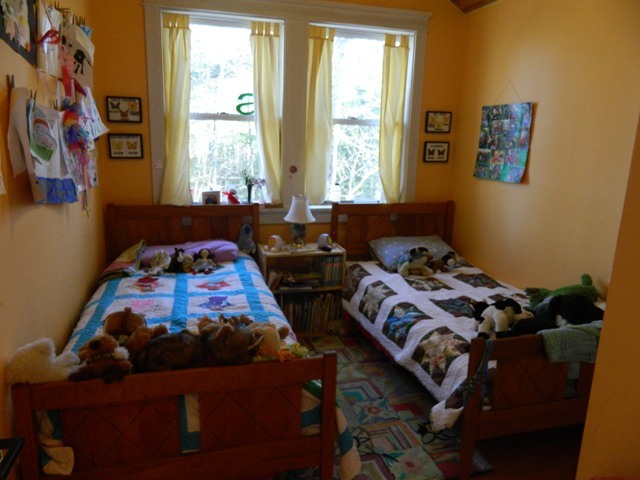 Then, after a few nights: “Annabel, want to have a sleepover?” There we were again, two kids, one room, one in a bed, one on the floor. Again and again and again. After a few weeks of this, there was really only one solution. 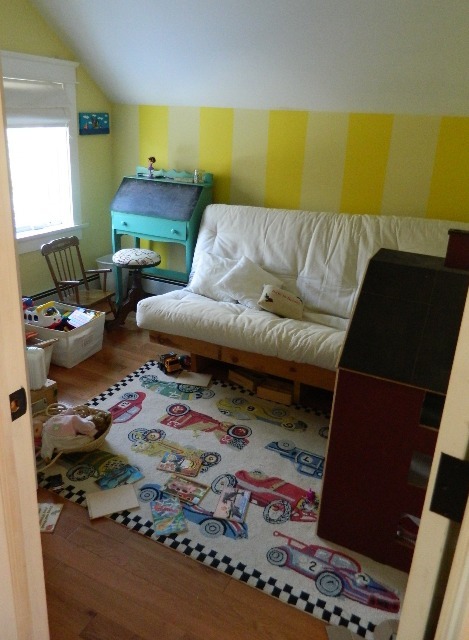 It’s cozy, sure, but at least we have a playroom now. Okay, that part’s still a slightly messy work-in-progress. But that giant box of Legos is no longer in my living room alcove and we’ve now got a full-size futon for guests. So we’re going to call this a win. What does it take for me to post again? Cake. Oh, hi, internet. I’ve had a very busy summer. I have a lot to tell you. But not today. Today I had a request for my apple cake recipe and while I would like to tell you about hiking, gardening, housebuilding, and kindergarten, first I need to do this. I discovered this recipe a few years ago and it exists on a very strange, very small website that I don’t even understand. I don’t know how I found it; I don’t know who these people are; I don’t know if this website has been updated since 1996. What I know is this is a great apple cake. Full credit, however, goes to them. But, of course, I am incapable of making any recipe without changing it to within an inch of its life–usually by healthifying it. So first is the regular recipe. Then is the version I usually make and which I feel is healthy enough to give a kid for a snack. Heat oven to 350 degrees. Mix apples and sugar thoroughly. Add oil, nuts, eggs and vanilla. Mix dry ingredients together and add to apple mixture. Bake in a greased 13×9 inch pan for 45 minutes to 1 hour (check after 45). Serve frosted or unfrosted. This cake is one of those that you can pretty much finish and serve however you like. If you want to frost it, a sour cream frosting is very nice. Whipping cream or ice cream go very well with it, too. My favorite way to eat it, though, is with no frosting at all. Follow directions as above. The whole wheat flour that I use is very dry, so I add a little water to the batter to offset it. You may need to adjust accordingly. If you bake a lot, you will notice that this batter…looks weird. It’s very thick and full of apples and kind of hard to spread in the pan. Don’t worry. It will be okay. My family is anti-nuts in baked goods, so we don’t do that. But that would make this an even healthier kid snack so if that’s your gig, try it. And she’s totally right. You absolutely do not need to frost this thing. At all. Annabel launched into a impromptu soliloquy about bees during the morning drive, so I made it into a poem for you. I like the music they make when they hum. I like that they land on flowers and make more flowers. They don’t sting if you don’t bother them, Sam. A pox on our house. And possibly yours if you get too close. 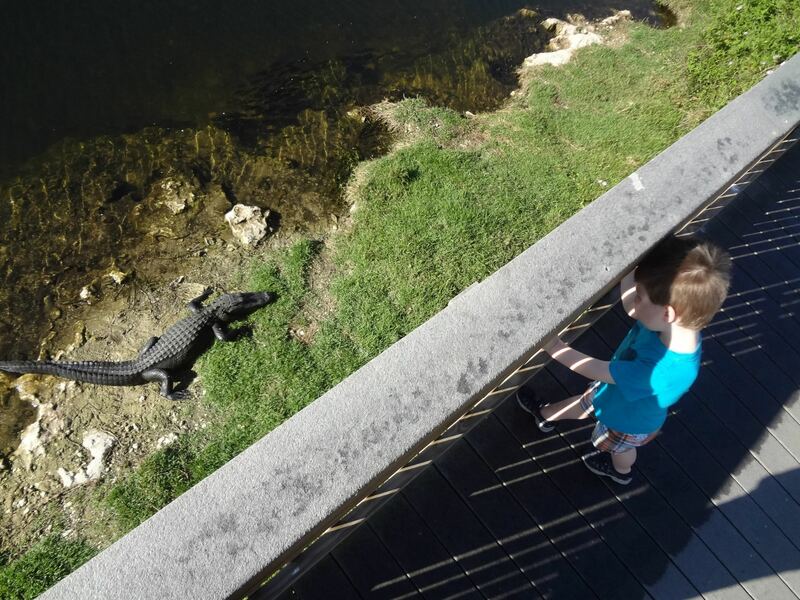 About a month ago we made our annual pilgrimage to Florida. This post isn’t about that trip, which was fine, but not our best vacation ever. 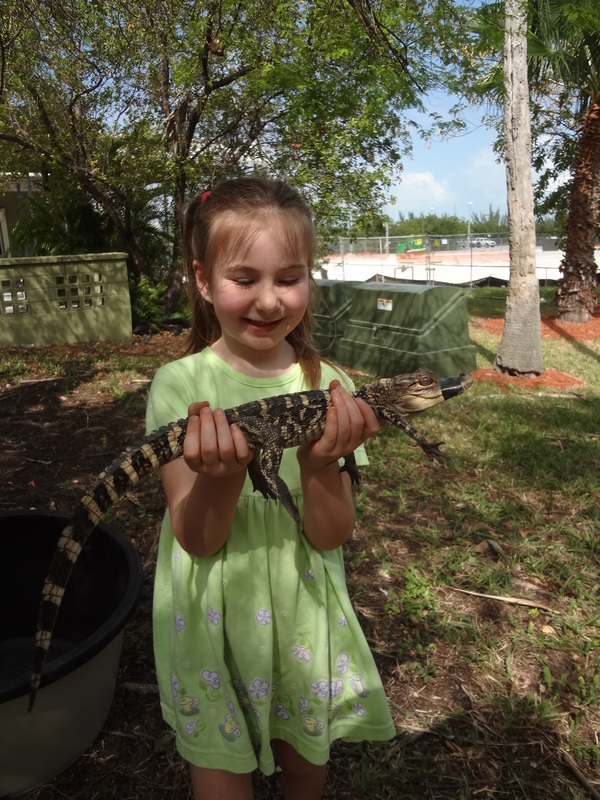 We did our usual eating of fried foods, drinking of Cuban coffee, and letting our children play with alligators. This trip was not the best for a few reasons, not least because Michael developed an odd rash the day before we left. We pondered it for a bit, but as he didn’t seem in immanent danger of dying and we had packing to do, we ignored it and went on our merry way. And merry it was, until the next day when we realized the rash was spreading and that it was becoming increasingly painful. All the image searching of rashes that we could do (and, please, don’t search rash images unless you really, really have to) seemed to suggest that it was shingles. But it couldn’t be shingles because Michael’s never had chicken pox. So we searched and searched and finally he showed the rash to his mother. “But I’ve never had chicken pox,” he said. And just like that, we learned that not only had Michael had the chicken pox after all, rendering moot years of discussions about how we’d handle chicken pox in our kids, but he also had shingles, a disease generally limited to the elderly and the infirm. Now, shingles, for those who have not had a reason to extensively research it, are caused by the same virus that causes chicken pox. After you have the pox, the virus stays in your body, hanging out in the nervous system until a weakened immune system allows the virus to gain a foothold. At that point, the virus travels along your nerves until it reaches the skin, where it causes a rash. This sounds creepy and painful, and it is, and it pretty much ruined Michael’s vacation. It didn’t do a whole lot for the rest of us, either, as we tried to accommodate a downed member of the family. Everything we read suggested that it was possible to catch the chicken pox from someone with shingles, but it was pretty rare. For transmission to take place, a non-immune person essentially has to come in direct contact with the rash. “So just don’t rub the children’s faces on your oozing sores and it should be fine,” I said, looking up from my father-in-law’s computer. “Got it,” Michael said. And he kept his shirt on and washed his clothes separately and that was that . Or so we assumed. About a week after we returned home from Florida, I found myself in the bathroom getting the kids ready for bath. I pulled Annabel’s dress off and immediately noticed three small, red dots on her stomach. “What’s that?” she asked, curious but not scared. The next day I took her increasingly spotty self to see the doctor, which I had to do in order to make sure that her immunization records showed that she’d had the disease. I, again, was less enthused. Because I believe in giving full credit where credit is due, I need to tell you that Annabel really was a superb chicken pox patient. She rarely complained, she tolerated quarantine even when it required her to sit endlessly in the car while I ran errands, and she was generally excellent company. But by the of the mandated six-day sequester, she was healed up and quite ready to go back to preschool. I packed her up, sent her on her way, and assumed it was over. You may wonder why I was so casual about the whole thing considering that I have another child in the house. The reason is this: Sam had received the chicken pox vaccine. We had intended for neither kid to get it until they started school, believing that natural immunity had a slight edge over vaccine immunity during the course of a lifetime (though we went back and forth on this a lot especially considering–remember?–we thought Michael had never had the chicken pox). But we learned when reviewing Sam’s vaccination records at his three-year check-up that somewhere along the way he’d gotten the shot. We didn’t really mind either way, and, frankly, by the end of Annabel’s bout with the pox I was tired of calamine lotion, hideously behind at work, and pretty much done with the varicella zoster virus altogether. Plus, I was feeling pretty lucky that Annabel’s case was as moderate as it was and I wasn’t really looking to roll the dice a second time. But, hey! Guess what! A week after Annabel went back to preschool I was pulling Sam’s shirt off for bath (seeing a pattern?) when I noticed tell-tale red spots all over his stomach and back. So I hauled him to the doctor the next day, which happened to be yesterday. “This really is unusual. Believe me.” And I believe her. My 37-year-old, generally healthy husband developed a illness usually limited to the elderly and the infirm from a childhood disease he never knew he had. Our daughter then gave the disease to our son, despite his being vaccinated against it with a vaccine considered around 90% effective. I had the chicken pox when I was a kid. I don’t remember having it, but I definitely did. I’ve never in my life worried about getting it a second time. But right now? I’m looking at how percentages are running for us and I’m thinking, boy, I am basically guaranteed to end up in that 1%, aren’t I? A few friends who have followed this saga have mentioned that I should buy a lottery ticket. It seems to me that the luck we’re running is actually the exact opposite of what is needed to win the lottery. What would happen if I went to buy a lottery ticket is that I would somehow bump into the person behind me, causing them to slip and fall and sustain tremendous injury. They would then sue me for everything I have, including my family, who I would be forced to sell for cash, and I would end up destitute, penniless, alone, and covered in the first-ever-known simultaneous case of chicken pox and shingles. So buying a lottery ticket doesn’t seem like the right move. But I might do it anyway. Because I really am that dumb.